Only three films have won Best Picture, Best Director, Best Adapted Screenplay, Best Actor, and Best Actress at the Academy Awards: One Flew Over the Cuckoo’s Nest, The Silence of the Lambs, and It Happened One Night. It Happened One Night, directed by Frank Capra and written by Robert Riskin, was released in February 1934, and it remains one of the best Great Depression-era escapist romantic comedies. Ellie Andrews, played by Claudette Colbert, is a rich, bored socialite who has married a man her father disapproves of, mostly for the sake of having something to do. After her father tries to force her to annul the marriage, she literally jumps ship — straight over the side of her father’s yacht. Ellie hits the road in disguise, with a grand plan to make it all the way from Miami to NYC to reunite with her beau. 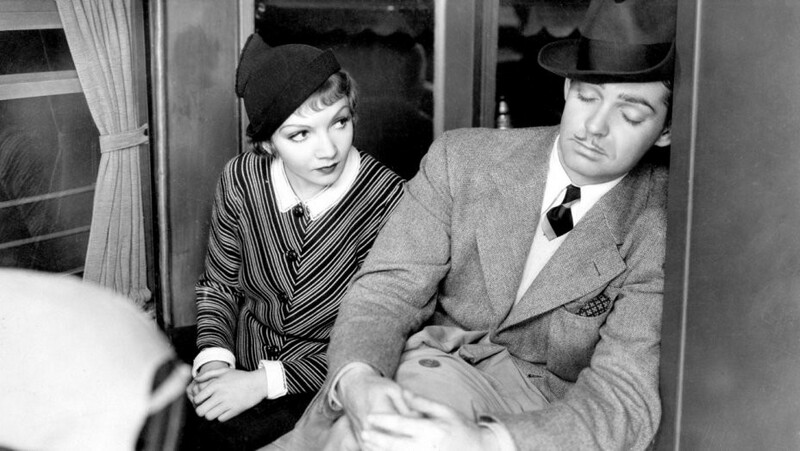 On the bus she boards, she meets a journalist named Peter Warne, played by Clark Gable, who decides to help her in the hopes of breaking the big story about the missing socialite. Along the way, of course, they fall in love, and lots of hijinks ensue. The film especially picks up after Ellie and Peter get off the bus and are forced to make their own way north. Cue an especially amusing hitch-hiking scene and the always entertaining predicament in which two people who ostensibly dislike each other must share a room under the guise of being a married couple. Like I said, hijinks. The jokes hold up pretty well, and there’s even a hint of a class critique: yes, Peter, a man of the people, falls in love with a wealthy socialite, but only after she’s (temporarily) in almost dire financial straits. Although the first half of the film very much treats Ellie like a naive little girl, it eventually allows her to come into her own as a character who is more than capable of keeping up with the sarcastic but golden-hearted Peter. That shift in their relationship also allows Colbert and Gable’s chemistry to shine through. If you’re looking for a warm and charming film to get you through the cold and dark month of February, look no further than It Happened One Night. Revisited: It Happened One Night was originally published in The Yale Herald on Medium, where people are continuing the conversation by highlighting and responding to this story.